Over the past few months, I've probably mentioned quite a few carrier oils, but I haven't really gone into detail about what they are or what they do. 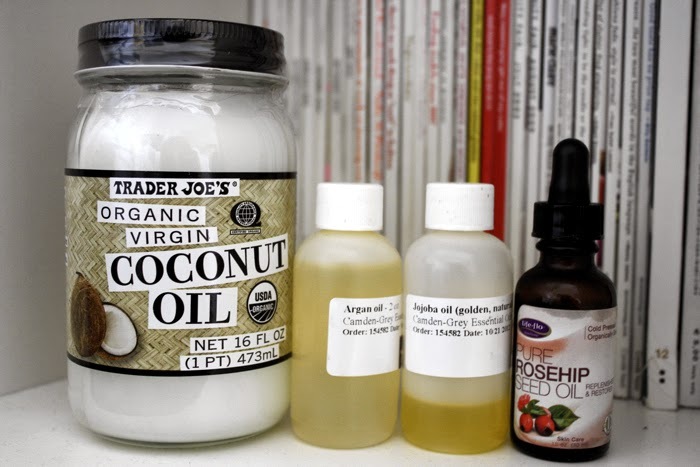 Since I got into the whole "natural beauty" thing, I've been slowly accumulating different carrier oils to use in my own natural beauty recipes and just for direct application. The purpose of a carrier oil, if you don't already know, is typically to serve as a base to which someone can add essential oils and apply to the skin (or hair), especially in massage therapy. Popular carrier oils are: olive oil, coconut oil, sweet almond oil, jojoba oil. Below, I'm going to list some of the most common carrier oils, and what they're used for and some of their benefits. Apricot kernel seed oil is very similar to sweet almond oil (see below), except it's especially good for sensitive, mature, dry or even itchy skin. It contains vitamin A and softens the skin. I've written in detail before about argan oil, but you have probably heard of or even used a product containing argan (or "Moroccan") oil by now. It's high in vitamin E and antioxidants, and it's often used on the skin, the cuticles, the scalp and in the hair. It's recommended for oily skin, mature skin, eczema and psoriasis, though it's not a fast-absorbing oil. It is not, however, recommended for acne-prone skin. Avocado oil is recommended for dry and mature skin types, as it's high in vitamins A and E, along with vitamins B1, B2 and D. It is a richer oil and is not typically recommended for use as a daily skin moisturizer unless you have extremely dry skin. Borage oil is said to contain the highest concentration of gamma linolenic acid (GLA) found in nature, and it's highly recommended for aging skin. It supposedly reduces the effects of aging and reverses sun damage. It's also used to combat eczema and other skin disorders. Camellia seed oil is said to be quick-absorbing, yet recommended for dry, mature or damaged skin. It can also be applied to the hair and scalp as a treatment. Like so many other carrier oils, it's rich in fatty acids, vitamin E, and antioxidants. Coconut oil has been talked about through and through, by yours truly as well. What's different about coconut oil is that it is a solid at room temperature. Otherwise, it's a multi-purpose oil and works well as a moisturizer, a makeup remover, a hair and scalp treatment, a hair-loss treatment ... It is rather rich and takes a while to absorb, so it's not recommended as a facial moisturizer for those with oily or acne-prone skin. Some say that coconut oil has a tendency to stain clothing, so use caution. Evening primrose oil is often used in high-end skincare products, but it's very similar to many other carrier oils in that it is looked to for its healing properties. Like borage seed oil, it contains a high amount of gamma linolenic acid (GLA) and is good for dry skin, eczema and psoriasis, rashes, etc. Grapeseed oil is a slightly more common skincare ingredient, likely because it has a silky texture and is fast-absorbing. It is great for sensitive skin, as well as oily skin, and it contains vitamin E, fatty acids and antioxidants. Jojoba oil is probably the most well-known skincare oil, as it's more widely sold. Actually, jojoba oil is not an oil, but a wax! For that reason, it is especially stable, which is probably why it's so well-liked as a cosmetic ingredient. It resembles the oils created by human skin, which makes it easily absorbed. It works well with all skin types, but especially those that need extra healing: those with skin inflammations or rashes, dry skin, mature skin, and even acne-prone skin. Kukui nut oil, derived from the official tree of Hawaii, is known for its healing properties and quick absorption. It is used most often to soothe burns, chapped skin, eczema, psoriasis, rashes, acne, dry and aging skin. It is also used in the hair and on the scalp, and may prevent scarring. You may not think to use the bottle of olive oil in your kitchen as part of your skincare routine, but it is often used as a skincare ingredient because of its stable nature. You might know already that it's quite rich, so it's typically used in hair treatments and on particularly itchy or dry skin. It seems that seabuckthorn oil might be the most popular oil on the block right now (or is that camellia?). Seabuckthorn oil is used to treat damaged or dry skin. Like its peers, it is rich in vitamin E and fatty acids. It is a deep red color and could stain the skin if used too liberally, but the color can be washed off. Sesame oil is known mostly in the culinary world, but it can be used in skincare to help treat dry skin, skin ailments, and even arthritis. It is high in antioxidants, fatty acids, and incredibly stable. Sweet almond oil is recommended in most homemade lotions and creams because like jojoba and rosehip seed oil, it's a relatively dry oil and said to be similar to the oil produced by a baby's skin. It's good for all skin types, and has excellent hydrating properties while absorbing relatively quickly into the skin. Sweet almond oil is also said to contain vitamins A, B, E and fatty acids. Tamanu oil is another healing oil that addresses scars, burns, rashes, cuts, stretch marks, etc. It's also antibacterial, anti-fungal, anti-microbial, anti-inflammatory, an antibiotic and an antioxidant. Like sweet almond oil, it's full of fatty acids and supposedly suitable for all skin types, as it's said to help clear up acne and heal acne scars. What carrier oils do you currently use in your skincare regimen, and which ones (if any) are you looking forward to trying?